In medium bowl, mix soup, potatoes (dry), cooked vegetables, thyme and pepper. Unroll 1 can of dough; spread with half of soup mixture. Starting at shortest side, roll up; pinch edges to seal. Cut into 6 slices. 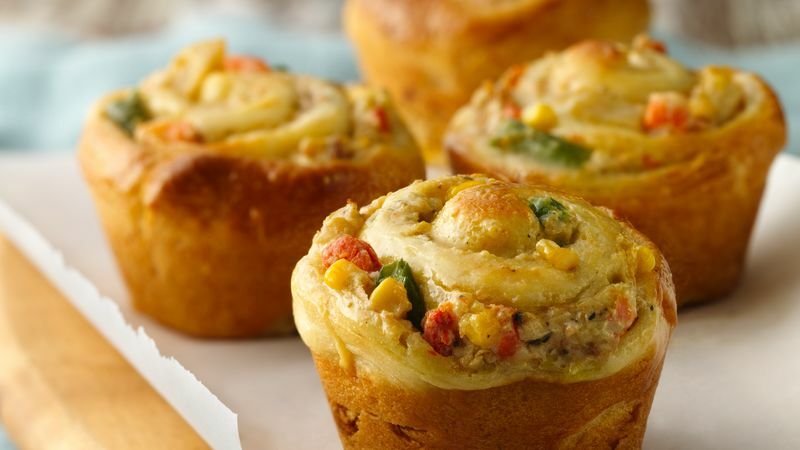 Place 1 slice in each of 6 muffin cups. Repeat with remaining dough and soup mixture. Bake 25 to 30 minutes or until golden brown. Brush top of each with melted butter; remove from pan. Serve immediately. If substituting crescent rolls for the dough sheet, be sure to firmly press perforations to seal before spreading with soup mixture.